The first elevator appeared in a New York building in 1857, during the industrial revolution. Principles of operation have changed little since that time. ArchiExpo classifies elevators by their motive system, electric or hydraulic. Elevators are found primarily in public, residential, commercial and industrial buildings, but are also present in some private homes. 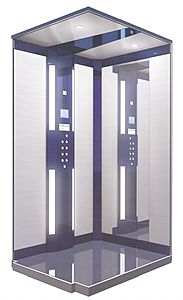 Electric elevators are the most common type. Machinery is usually housed on the roof or the uppermost floor of the building. The base of the shaft is in a half basement. A system not requiring a machine room was invented in 1996. Mechanical (hydraulic) elevators consume more electricity and are slower than electric models. The machine room must be at the base of the shaft where the hydraulic pump is located. Choice will depend on the number of floors in the building, frequency of use, shaft dimensions and the possible need for a machine room on the roof.